Growing up in the South, I never had much of an opportunity to see snow. I saw most of my snow scenes on TV and the few times it did snow, you can imagine how exciting it was. My husband, on the other hand grew up with snow but neither of us had an experience with snow skiing. 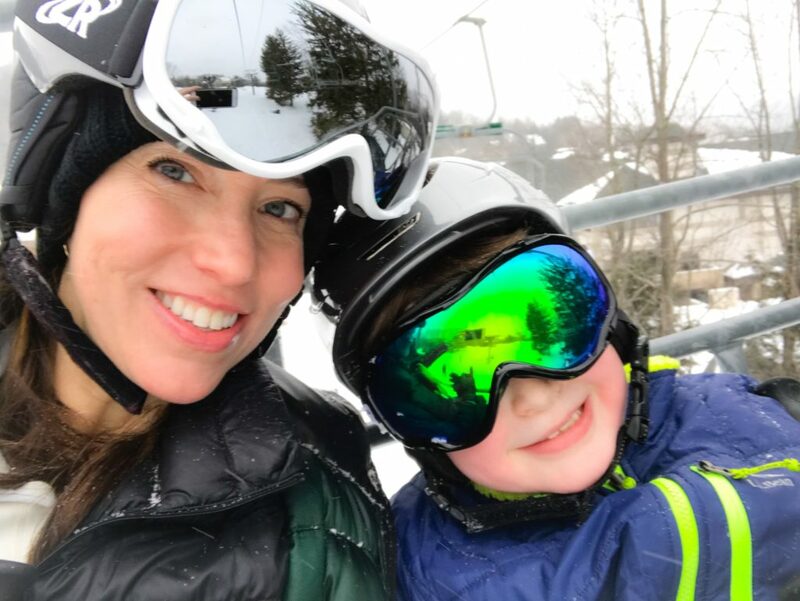 Now that our own kids are at the age to ski and participate in so many winter activities I started to explore all the options available to us in the Northeast Area. 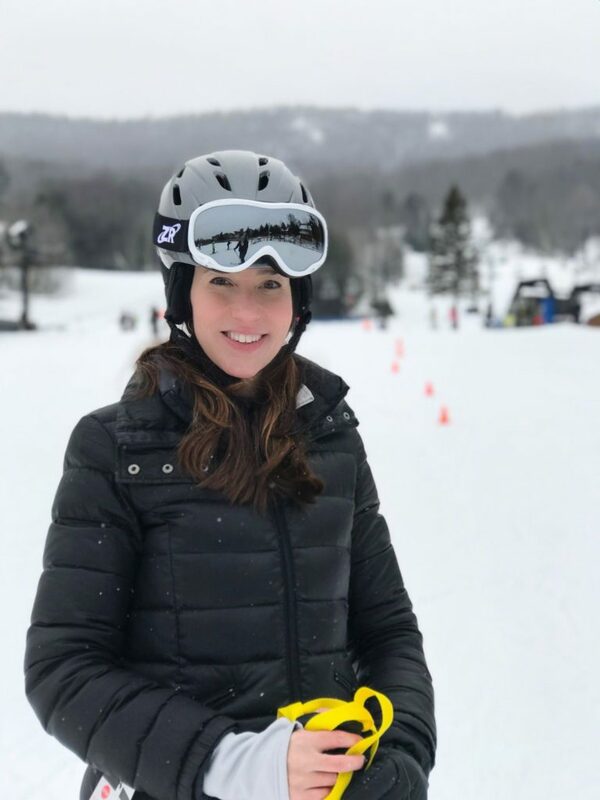 I attended an event in the Fall at Tavern on the Green hosted by Empire State Development, Division of Tourism and was blown away at how many local ski resorts there are within driving distance of New York City. I was able to speak with ski resort representatives and hear about all the different packages and deals available for the 2017-2018 ski season. 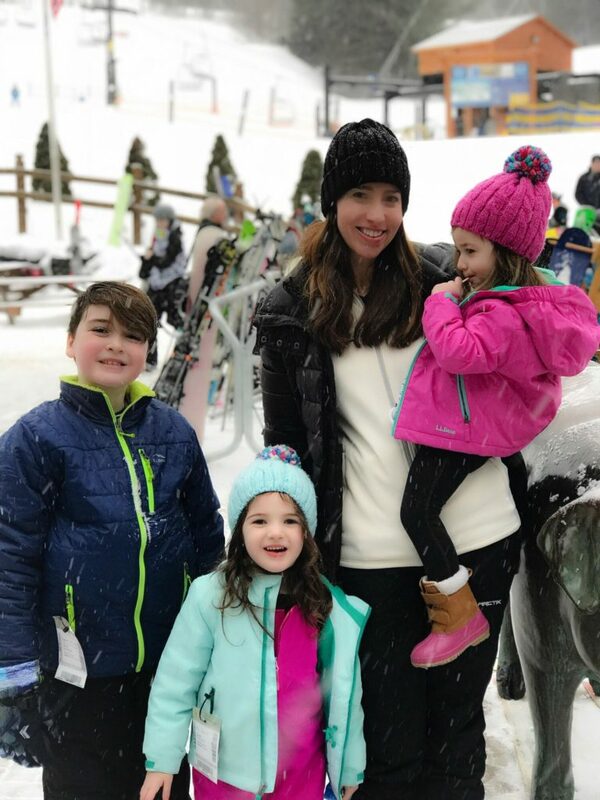 As a typical New York family, we like to do things quickly and spend as little time as possibly traveling so I was pleased to hear there were plenty of resorts within a 2 hour distance from the city. 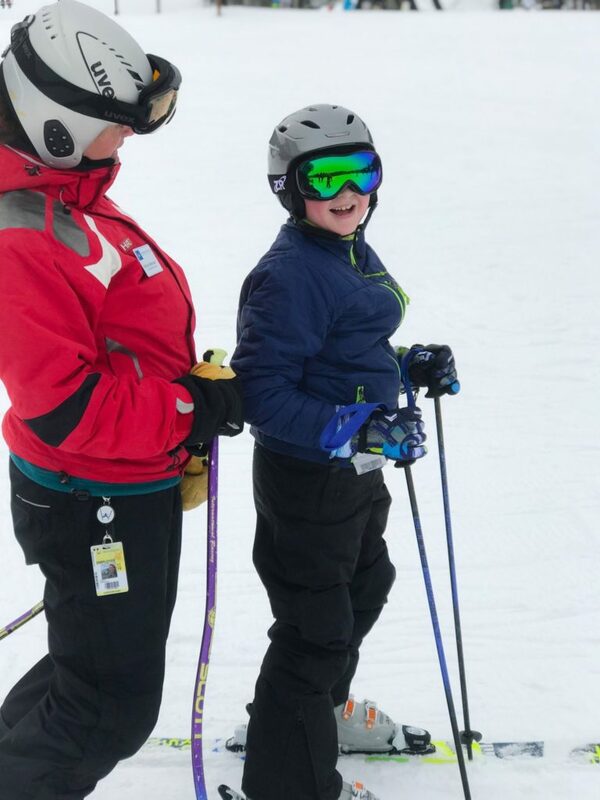 My children are 2, 4, and 9, so once I discovered some of these resorts had child care services I was eager to start learning more. 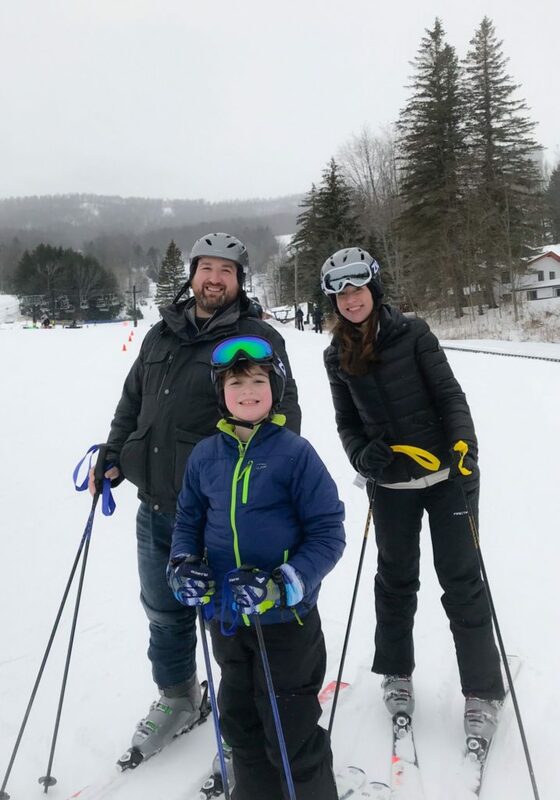 I recently partnered with Windham Mountain Resorts for a “first timer’s ski experience for my family.” Located in the beautiful Catskill Mountains, Windham Mountain was only a 2.5 hour trip from our home in lower Manhattan. We loaded up the car and hit the road for our “ski trip”! This was also our first time to visit the Catskills. It didn’t take us long before we started to see the snow covered mountains driving in the car. My son was super excited with the thought that he would be going up one of these mountains and truth be told I was just as excited! As we got closer we could see more snow on the mountains which added to our eagerness. We decided to go up the night before to make sure we were up and ready to go. Skiing starts early and ends somewhat early in the day, so it’s important to make the most of your time. Also, I know how long it take us to get moving with 3 kids so it was clearly important we stay close to the resort. 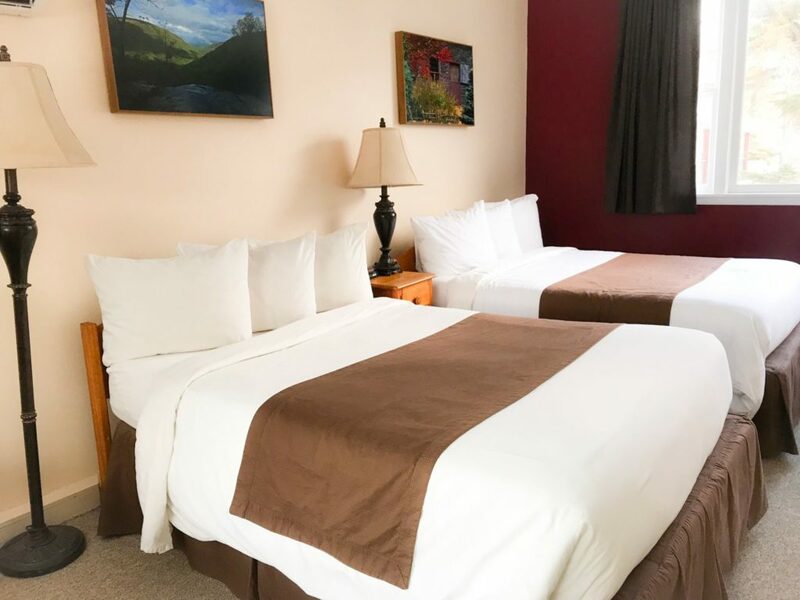 The Winwood Inn and Condominiums is located just a quick 3 minute drive from the actual Windham Mountain Resort. Transportation is provided or you can easily drive there your self. This quaint inn was the perfect setting for our ski trip complete with a crackling fire in the lobby. We had a spacious room with an amazing view of the mountains we would be visiting the next morning. We dined on site at Rock’n Mexicana which adjoins the hotel lobby so we didn’t even have to leave! Bonus points: This happens to be my favorite type of food so I was the most excited! 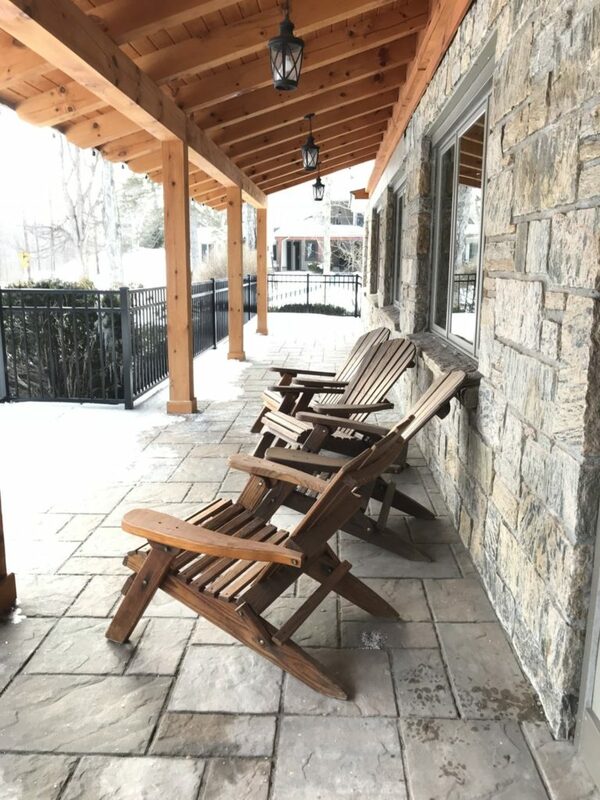 Winwood Inn and Condominiums offers so many benefits including an ski and stay package starting at $85 per person. 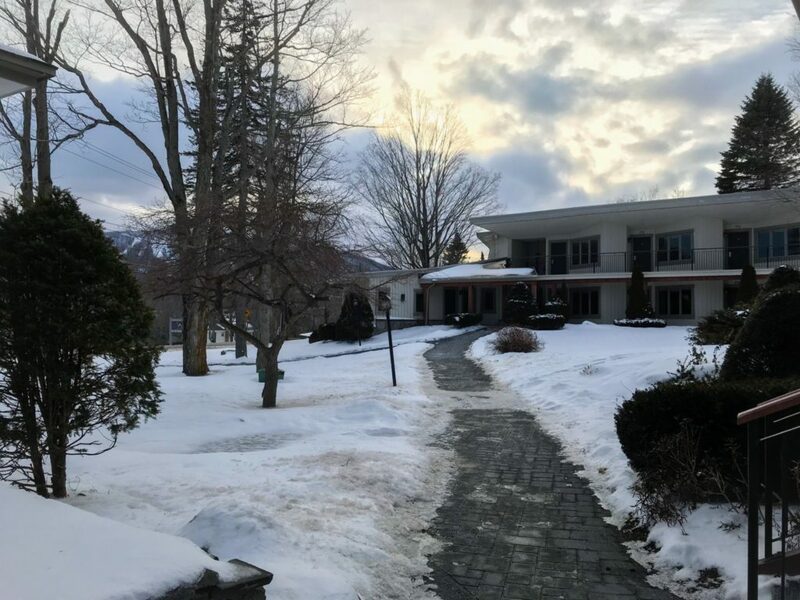 This includes lodging, continental breakfast, a lift ticket and shuttle services to Windham Mountain. After a quick complimentary continental breakfast we were off to Windham Mountain Resort. It literally was just around the corner and since we arrived early parking was very easy. There were plenty of buses arriving around the same time which showed me what a popular ski destination Windham is. 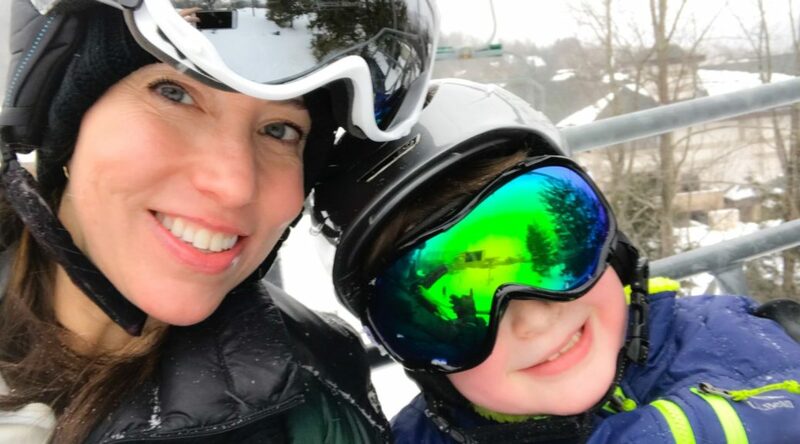 Since my girls are younger, it was important for me to find a resort that offered childcare while my husband, son and I learned to ski. Windham offers childcare for kids ages 2-7. My 2 and 4 year old were able to spend the day at the Children’s Learning Center. 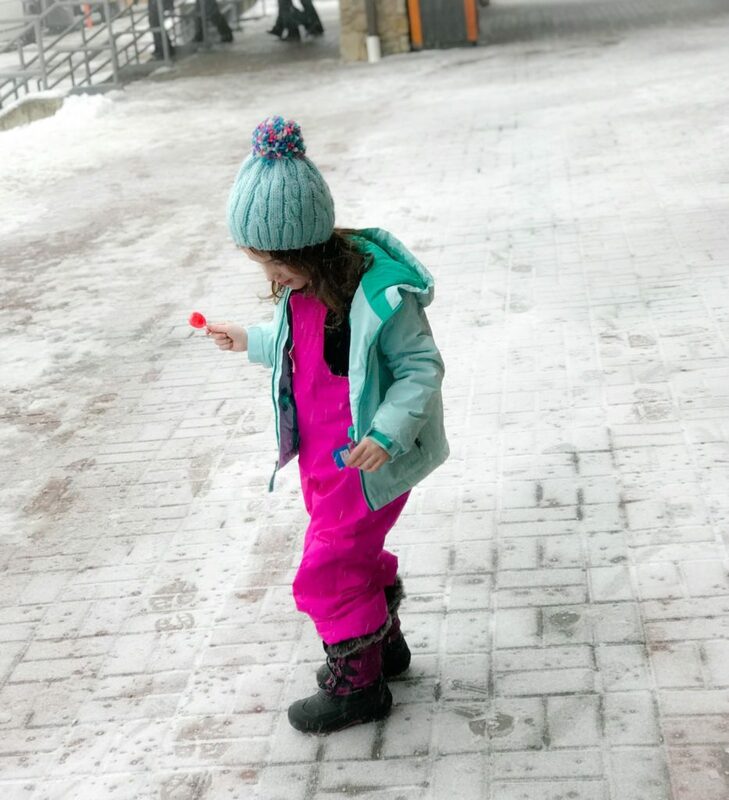 Additionally, my 4 year old was able to have a ski lesson. We could see her from a distance and although I didn’t want to interrupt, I could tell she was having a great time! I could see her confidence soaring even from afar. 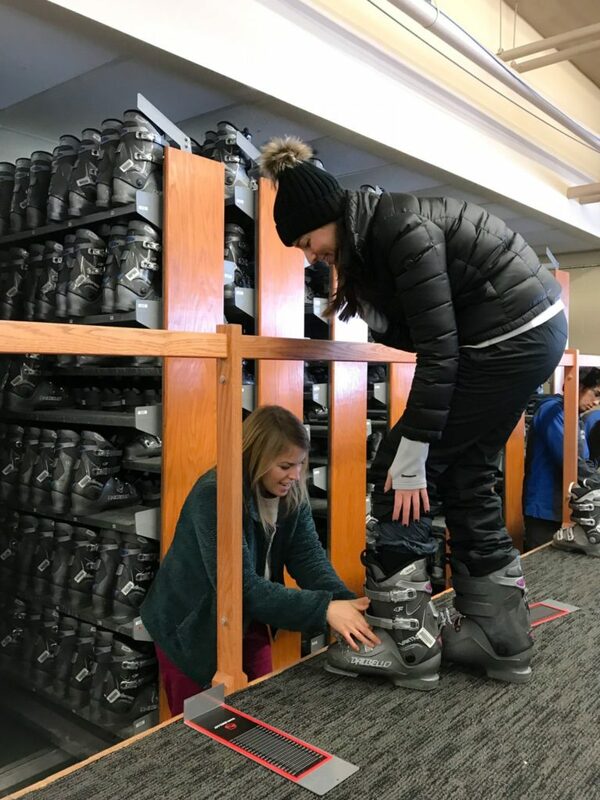 I made sure she had everything she needed in terms of hat, coat, and waterproof gear and they took care of the rest getting her sized up for boots, skis and a helmet. It was a seamless check in process and I was at ease knowing they would both be taken care of for the day. You can choose a 1/2 day or full day based on your schedule. Once again, I really had no idea what to expect since this was our first time at a ski resort. 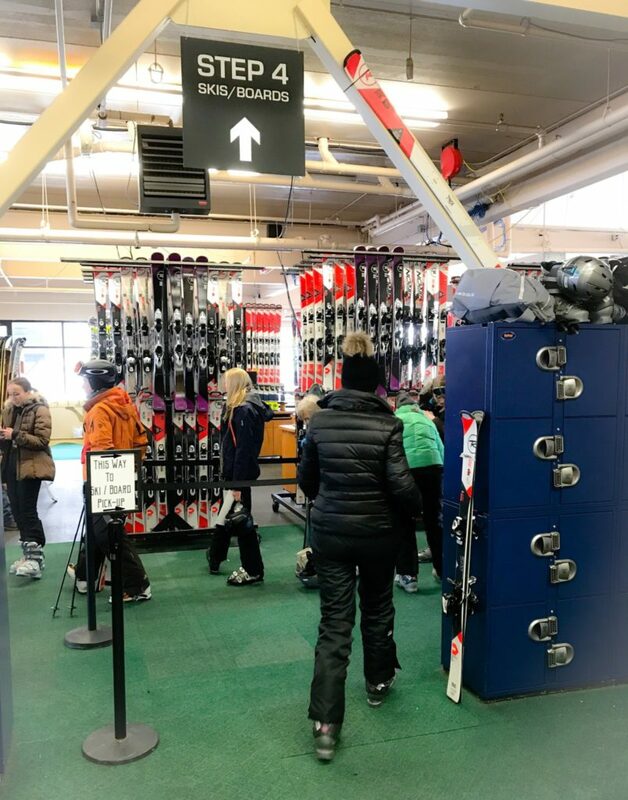 Windham is easy to navigate and we were directed to the rental equipment area for boot and ski fittings. 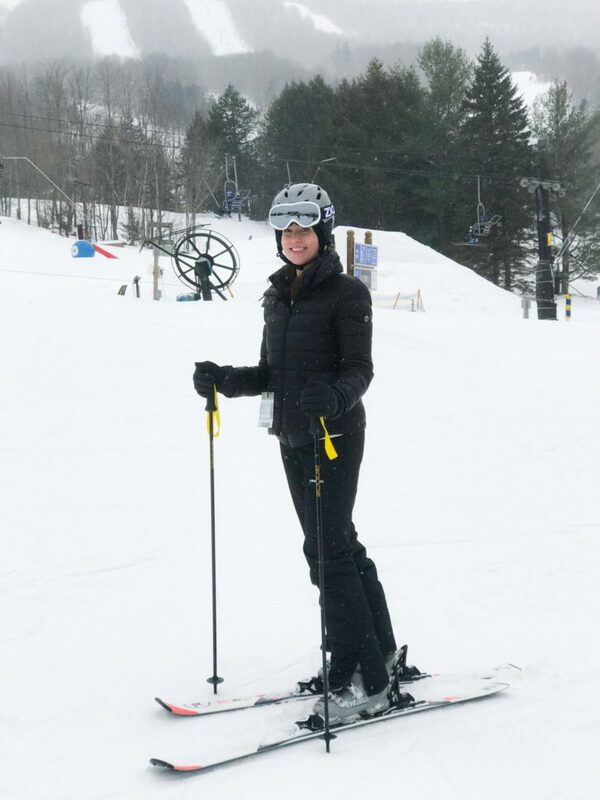 Of course I had on multiple layers of socks but I learned the ski boots are so insulated, you only need one pair! Lesson learned! The boots did feel a bit awkward at first but we got used to them once they were in the skis. All the equipment was really new looking and high quality. I had previously heard horror stories about rental equipment but everything I saw was in excellent condition. Once we went around to the different areas boots, skis, helmet and poles, we were off to find our ski instructor. The instructors at Windham are really pros. They clearly know what they are doing and knew instantly how to handle my sons hot and cold temperament. They had him listening in no time and he was eager to master one skill after the next. My husband and I followed along and we all learned at the same pace. Who knew words like “pizza” and “french fry” had so many meanings! There was this awesome moving path called a “magic carpet” that allowed the beginners to move up a hill easier than side stepping all the way up. We stayed in the learning area for awhile until we were confident. Speaking of confidence my son visibly changed before our eyes during such a short duration. He is a type of kid who wears his emotions on his sleeve so it is no secret how he feeling at any given point. 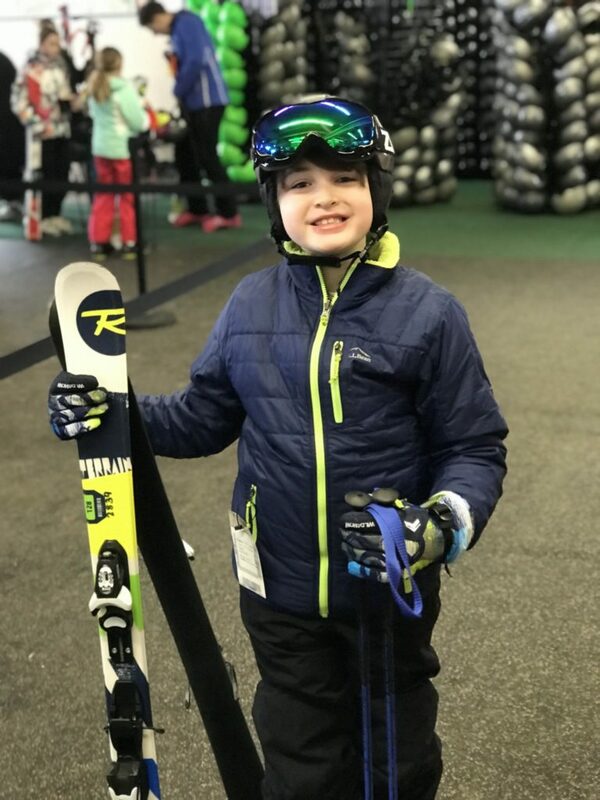 He was concerned in the beginning he would be a “bad skier” but at just over an hour into lessons he displayed such enthusiasm and his entire demeanor changed. 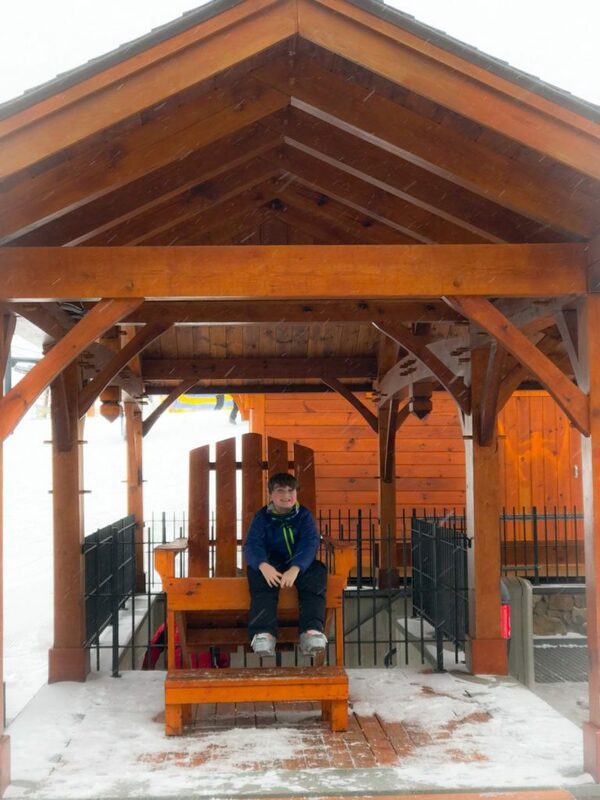 He revealed to us how much fun he was having and that Windham was the best place in the world! We had to force our son to stop to take a lunch break which luckily he did. There is a large cafeteria style indoor restaurant with anything you need. Food options range from sushi to salad to burgers and everything in between. 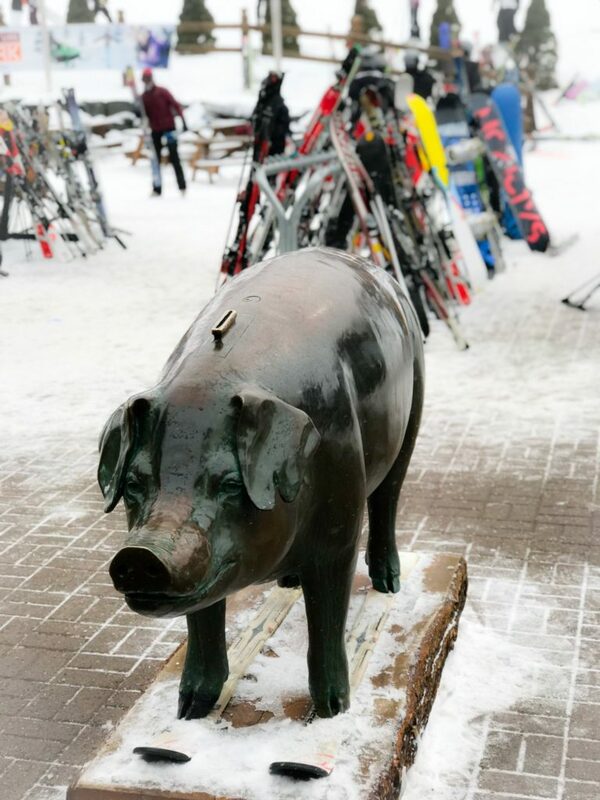 Skiing definitely works up an appetite so we put a few extra things on our plates! 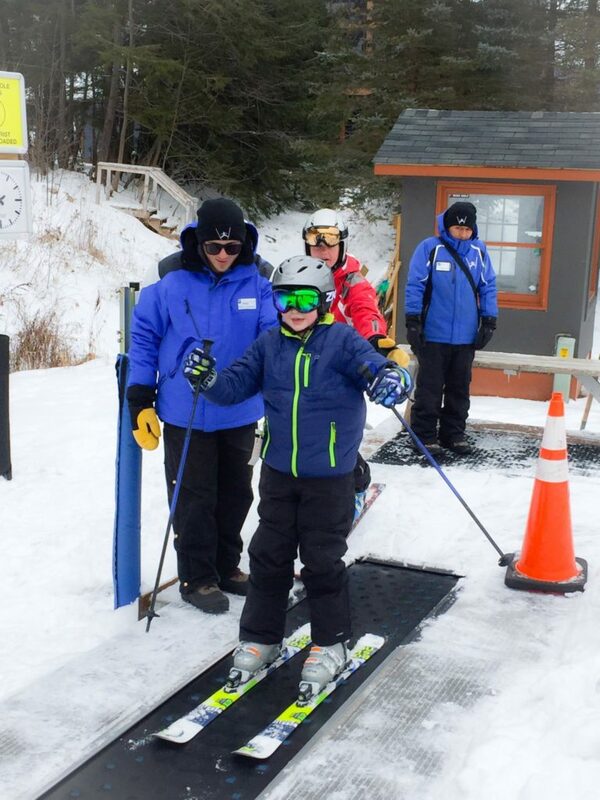 After lunch, my son had another ski lesson while my husband and I attempted to ride the ski lift for the first time. I say attempted because our first try at unloading was not a pretty site as we both wiped out. 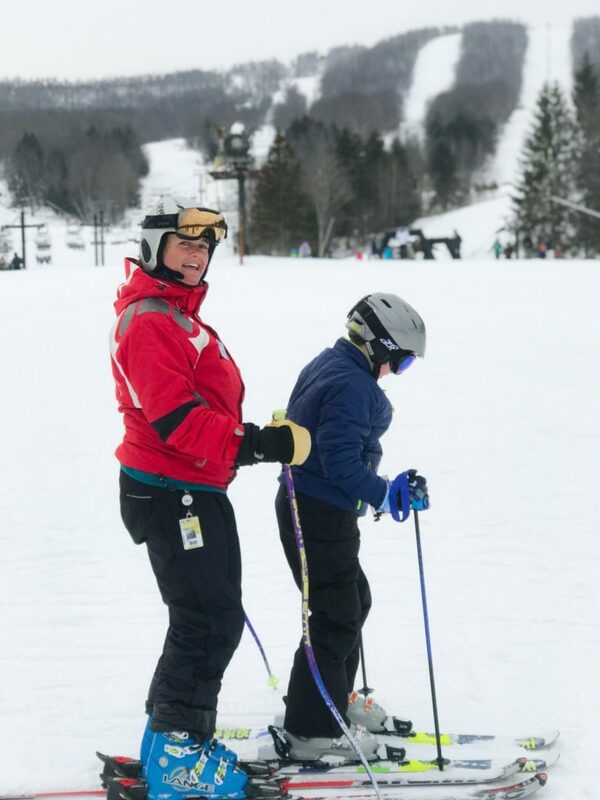 I learned, however, that falling is such a common occurrence while skiing and there was always a friendly staff member near by to help pull us up. Speaking of staff, there was certainly no shortage at Windham. They were easy to spot in bright red jackets and their friendly guidance was always a comforting feeling. 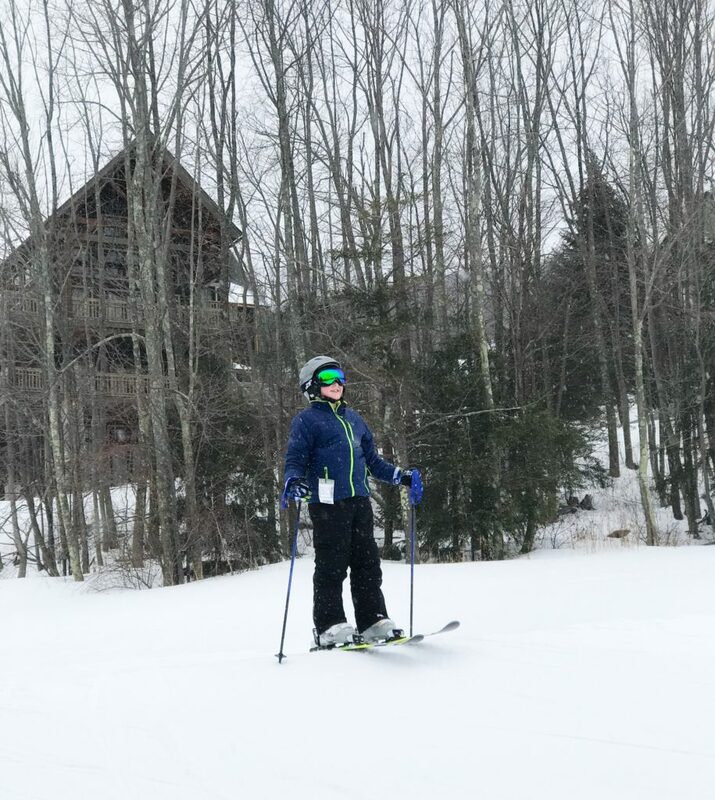 I was not able to talk my husband into joining me on the next highest lift and hill so I conquered my fears and went solo. The mountain was definitely a challenge and although I made it down it wasn’t my best performance ha! 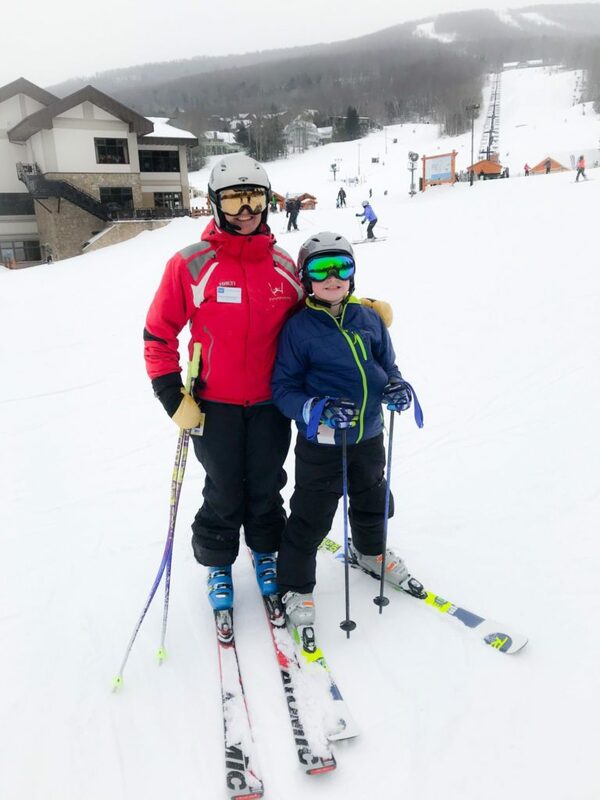 After this, I met up with my son who was done with his private lesson and we went on the smaller hill and ski lift over and over. I was amazed at how well he was doing and we stayed on the slopes until the last possible second. Before dinner we joined back up with the girls who had a great day at The Children’s Learning Center. There is a beautiful restaurant separate from the cafeteria located upstairs that overlooks the mountains. It’s such a scenic view and we were able to relax and enjoy our time in this family friendly environment. Our journey did not end here. We had one last activity before heading home. 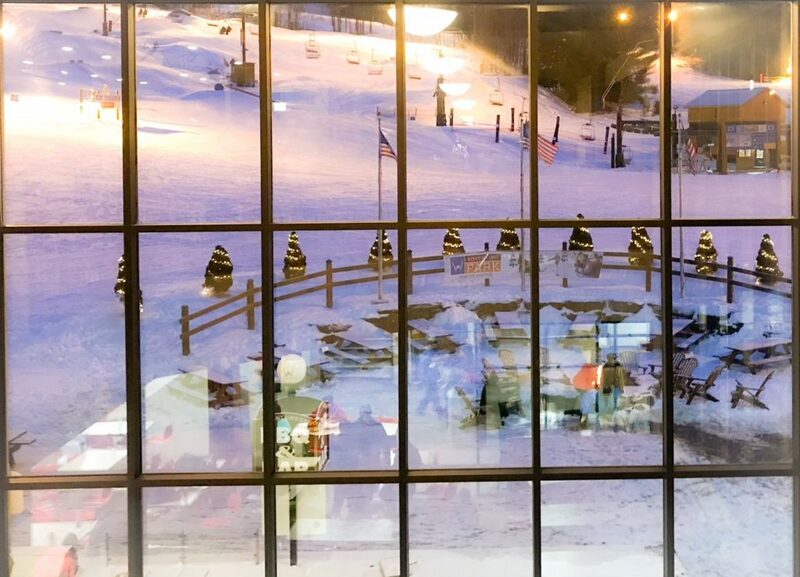 Windham Mountain Resort also offers snow tubing! This is one thing my son has done before several years ago but my 4 year old has not. She really hit her stride and the bitter temperatures did not seem to phase her. She went over and over and over until it was time to leave. 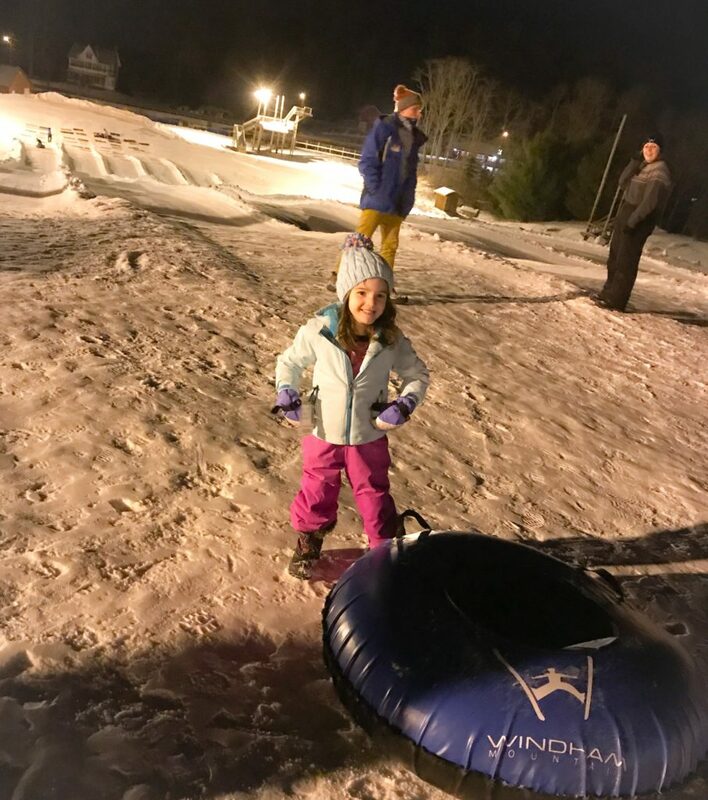 Snow tubing is a really fun activity at night and the new motorized track made it super easy to go back up the hill again. There are plenty of packages to take advantage of during the Winter season. 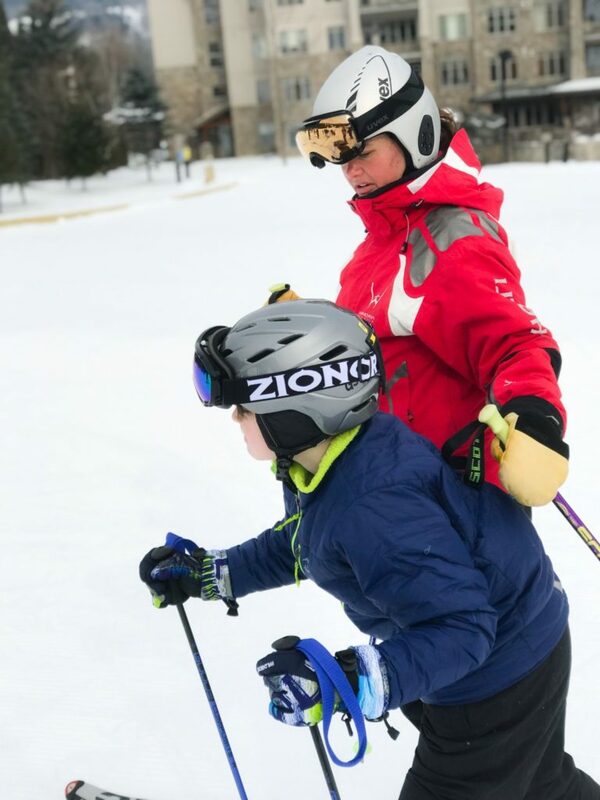 There is a Weekday ski and stay package starting at $85 per person including lodging at the Winwood Inn & Condominiums, lift tickets, breakfast, and free shuttle service. 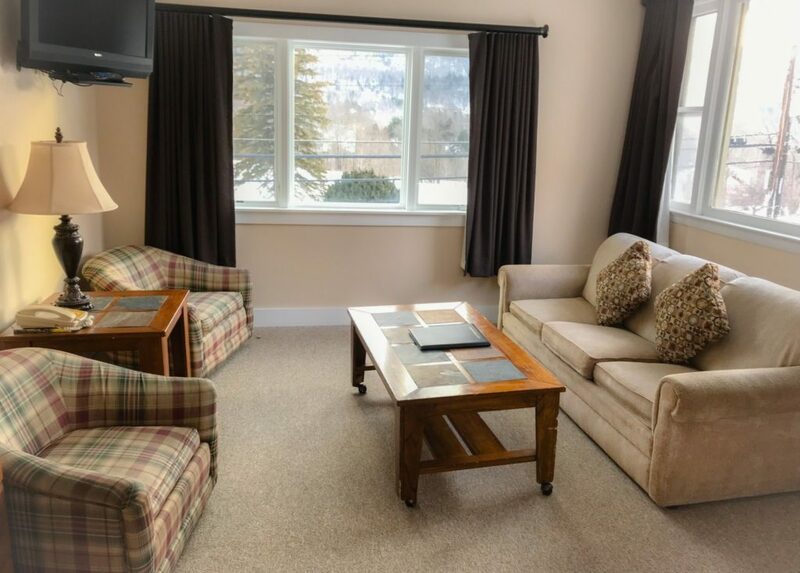 There is also a Weekend ski and stay package that starts at $130 per person. 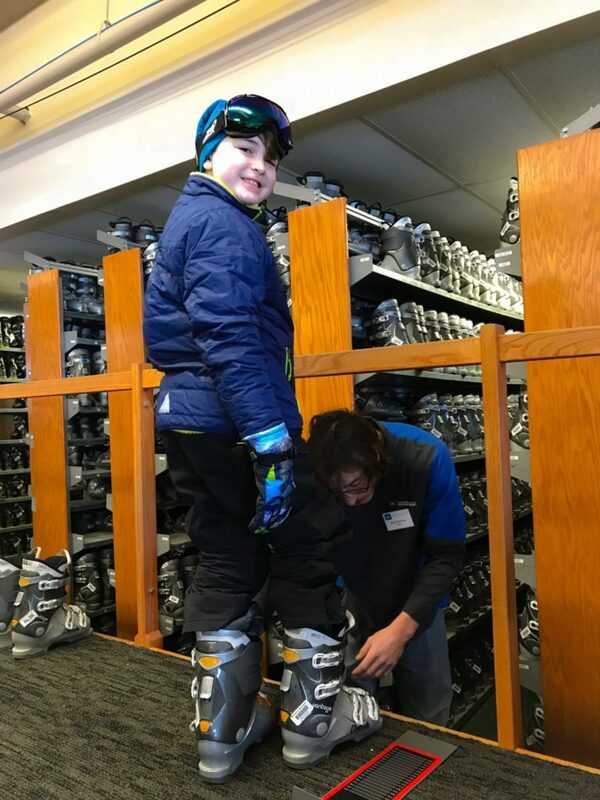 If you need a ride to the Windham Mountain Resort there are plenty of tour operators that can get you there. Go to windhammountain.com for a complete list. 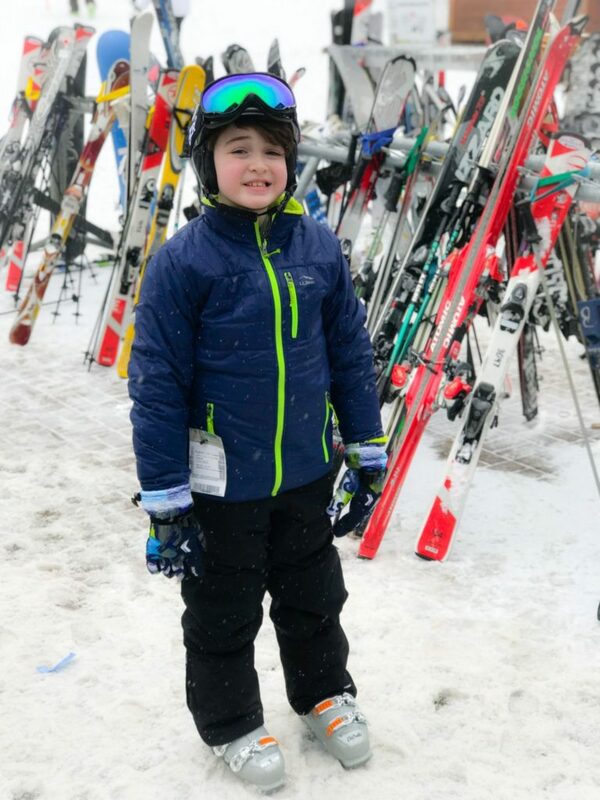 Our family certainly enjoyed our first timer’s ski experience and we will never forget the memories we made on the Catskill Mountains at Windham Mountain Resort! 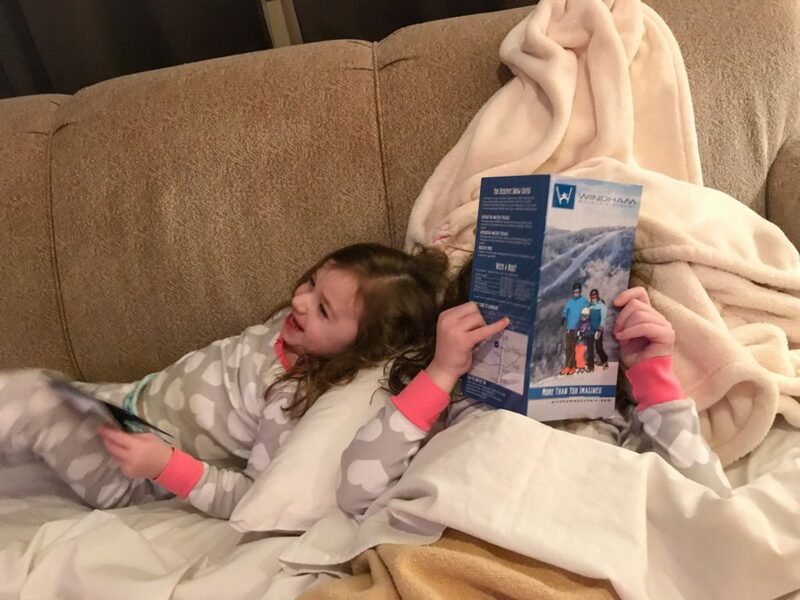 We look forward to our next adventure in the snow!